When you are young, birthdays are occasions to look forward to:- presents, parties, friends to play with, candles to blow out, wishes to make and a cake just for you with your name on it. Birthdays are a good-time celebration for children. When you get past 21, it becomes more of a quiet drink with friends and thereafter many people are trying to forget the passing of the years rather than draw attention to them. 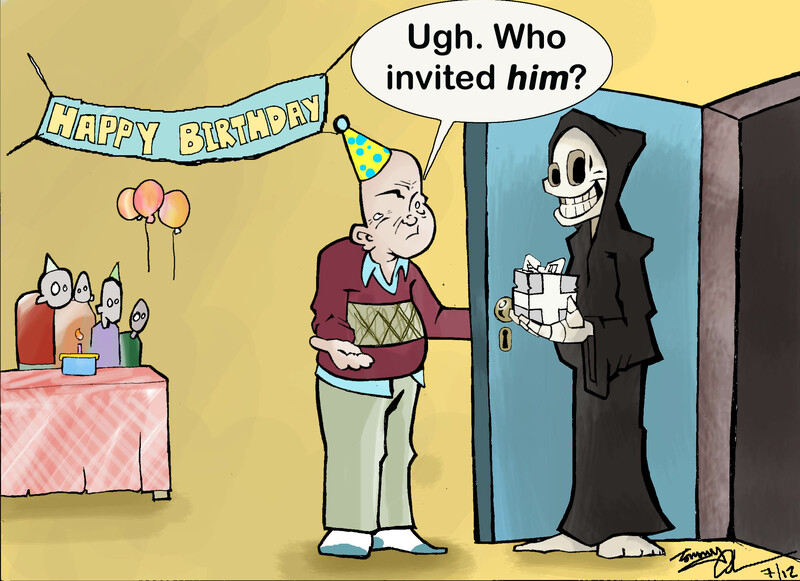 Now, thanks to some cheery research from the University of Zurich, it appears that once you have passed the age of 60, you are 14% more likely to die on your birthday than on any other day of the year. Doesn’t really make for happy reading———- but does it need to be so? We should start celebrating our age as we get past 60 and become more like children again. Have parties for all our friends before they slip off this mortal coil. Drink lots of champagne and eat vast quantities of cake – if our blood pressure and cholesterol go up for the day, so be it :-). We should also do something challenging on our birthdays to prove we are still alive – something we have never done before. If you live in Switzerland, then on your 60th birthday you could try climbing the North Face of the Eiger for the first time. If you’re one of the 44% who fall and die, well what a way to go :-). P.s. The researcher Gnomes in Zurich can go back to studying fun! This entry was posted in SMILES and tagged research. Bookmark the permalink. By God Sir! What I am looking forward to at my next birthday being over 60? I may be over the hill, full of pills and potions, But alas why the statistics from Zurich? Is it the Swiss Re-Insurance Industry ensuring that I chose Switzerland as my lasting Holiday destination, in one of their clinics? Can I open a Book on the month or the day of the Month of my choice, or could I have an accummulator and those facts and pick my year? Will they honour the bet, or like the bankers say it is a fix and run of with my bet and my premiums? What a thought for a day especialy on this day July 4 Indepenance Day, Freedom from those Brits, and the rule from London. What a thought you make me feel despondant, cheerless and well I wish to return you the compliment-Have a good birthday!!!! and avoid all those crooks after your estate-besides the friendly and loving family, who may be wishing you to open a book and maybe offer them a decision that they will have to ponder over!!! A bit sombre this article and my reply? Apologies to everyone! One has to have a smile and a joke, and words of comfort, and a birthday is a most pleasant way to celebrate all these emotions with ones loved ones and friends. Our own demise is without exception is out of our control, and the insurance industry usually banks on this, and being over 60 insurance is difficult, and then when one is 75+ insurance is almost impossible, so what is or are the University of Zurich Studying, Money off course, and lots of it, in gathered premiums denighed and unpaid out claims-Invalid I believe they call it? Paying for our own health care and support, which is difficult to find an economic risk for the decisions taken in earlier life, we see our money being eaten away, like us all in winds up the flue as smoke? Should we not have when we are in our 20’s a death policy which is based on risk and trust ( Not just a return of premiums but a modest amount of interest) by us all to ensure the next generation can at least have a good wake? This article is like picking the next archbishop of Canterbury? The only thing like selecting a pope it is a certainty that there will be one? Sorry to disappoint the experts in Switzerland but I always look forward to my birthday. I am 78 and love having birthdays – after all it means you have made another one. I don’t need cake or presents but I love having a good meal cooked for me in lovely surroundings and sharing the day with friends. I think people who come up with questionable? statistics like the ones you mention John are people with too much time on their hands. It would be so much better if they came up with statistics such as people who have been married seventy years – one of our residents has just celebrated 65 years of married life.- and they really are a happy couple, or people who are still lively and entertaining when they reach 98. I am sure figures like this would encourage people to live longer and have happy birthdays. Dear Oh Dear I fear the Princess of Jaw ache has struck again? I trust she will enjoy the jelly and ice cream plus off course lots of cake, and will not become one of John’s 6 Statistics, and suffer from the fally over water which helps the celebrations go with a swing? I think I will invest my Barclays money in Covent garden Market, or a florist shop: I see money there is to be made?? If I live that long??? Tat TahR- Happy reading you of the chattering classes.